An exciting journey to discover the best of Vietnam's stunning scenery, compelling history and captivating culture. This tour gave a great insight into Vietnam, with beautiful food, culture and scenery it was a trip to remember. Ha Long Bay was a definite highlight for me, the crew were fantastic and always helpful. I was able to immerse myself in the peacefulness of Trang An and explore the treasures of Hanoi. Vietnam is a country of beautiful landscapes, compelling history and culinary delights, and this tour allows you to immerse yourself in the country’s absorbing culture whilst enjoying good quality hotel accommodation from start to finish. The tour begins in the capital city of Hanoi where layers of Vietnam’s enthralling history are gradually revealed in the buildings, museums and places you visit. Whether walking past houses from the French colonial era, standing in line at the Ho Chi Minh Mausoleum, exploring the labyrinth of streets and alleys in old town or reflecting on the horrors of the Hanoi Hilton prison, you will gain a real insight into Vietnam’s rich and complex past. From Hanoi you travel south to enjoy Vietnam’s most notable natural wonders and attractions. First you visit Nimh Binh province, famous for its stunning limestone karst landscape of soaring peaks, giant caves and crystal clear waters. You will explore this area by boat, bike and on foot. Next you make your way to the UNESCO World Heritage Site of Ha Long Bay to enjoy time on board the luxurious Au Co cruise ship. You can relax on your private balcony, try your hand at a little fishing from the deck, enjoy cookery demonstrations and even take part in Tai Chi sessions. Whilst at sea, you will visit a cave, venture out to a village and have the chance to kayak to beautiful sandy beaches. After your cruise, you will continue south via Hue with its magnificent Royal Citadel before reaching charming Hoi An where you can sample tasty treats at street-food market. Your tour ends with time to relax and enjoy the evocative sights of Saigon (Hoh Chi Minh City) and explore the beautiful Mekong Delta by boat and bike. Meal arrangements: 13 breakfasts, 11 lunches, 9 dinners. Transfer from Hanoi to Ninh Binh. Explore by boat and on foot and visit the Trang An Landscape complex. Ha Long Bay cruise and sightseeing. Fly to Hue. Transfer to Hoi An. Guided walking tour. Visit My Son Holy Land. Cooking class. Day at leisure. Fly from Da Nang to Saigon. Sightseeing in Saigon. Mekong Delta bike ride and cruise. Time at leisure in Saigon. Fly to London. Our holidays in Vietnam are led by professional English-speaking Vietnamese tour leaders. They have an intimate and expert knowledge of the history, culture and nature of Vietnam. They will be sure to provide you with an unforgettable experience in their wonderful country of Vietnam. Day 2 - Arrive Hanoi. Group transfer to hotel. Half day sightseeing tour. Today you will arrive in Vietnam's capital Hanoi. Once you have passed through customs and collected your baggage, it is a short drive to the city. Your hotel rooms will be available for immediate check in, and the morning will be spent at leisure to relax and recuperate after the flight. Your first taste of authentic Vietnamese cuisine will be lunch at a local restaurant overlooking Hoan Kiem Lake. Hoan Kiem Lake is arguably the focal point of Hanoi - from old women practicing aerobics to teenage couples canoodling, there's always something interesting going on. Here you will visit the 17th century Ngoc Son Temple, and will hear the legend of the lake's legendary turtle and the 'returned sword'. This afternoon you will be taken to see one of northern Vietnam's cultural highlights - a private water puppet show. The water puppet artist is the descendant of a family of puppeteers and, after the show, there will be a chance to talk to the artist and view the handcrafted puppets. After the show you will take a walking tour of Hanoi's old quarter. This is a chaotic yet architecturally fascinating area with its appealing mix of old French colonial buildings and tall, narrow, Vietnamese style houses lining bustling streets filled with small shops, coffee houses and street vendors selling a dizzying array of wares. It is here within the old quarter that you'll learn the art of crossing the road, a task that may be daunting at first given the tide of mopeds and traffic, but will be second nature by the end of the trip! After the city tour you will be transferred back to your hotel to rest before enjoying a welcome dinner. Day 3 - Tour of the highlights of Hanoi City. After breakfast you will visit the Temple of Literature, one of Hanoi's oldest surviving buildings and said to be the oldest university in the world. Opened in 1076, the Temple of Literature (known as Van Mieu) welcomed only those of royal descent. However this was later changed so that all of those who were deemed gifted enough to study were admitted. The Van Mieu is one of Hanoi's top attractions with people coming to view its wonderful gardens and pagoda. Next you will visit the Hoa La Museum. Hoa La Prison was known ironically by the Americans as the 'Hanoi Hilton'. The prison was built in 1896 by the French when Vietnam was still part of French Indochina, and at its peak housed up to 2,000 Vietnamese, mainly political prisoners agitating for independence, with the majority of inmates living in conditions that can only be described as subhuman. The prison came to seen as symbol of colonial exploitation and abuse and was finally demolished in 1996. Today a small part of the jail remains open to the public as a tribute to the many who died within its walls. You will then head for the Vietnam Women's Museum, which although often overlooked is considered one of Hanoi's best museums. The galleries present three main themes, 'Women in Family', Women in History' and 'Women in Culture' ans show marriage customs, family life, traditional women's clothing, the role of women in defense of the nation etc as well as presenting exhibitions on contemporary social issues. After lunch at a local restaurant you will visit Ba Dinh Square and the Presidential Palace (formerly Palace of the Governor-General of French Indo China) and will also see Ho Chi Minh's House on Stilts, a humble, traditional stilt house where Ho Chi Minh lived intermittently from 1958 to 1969. The house is set in a well-tended garden adjacent to a carp-filled pond and has been preserved just as Ho left it. The views through the open doors and windows give a fascinating insight into his life. You will also see nearby One Pillar Pagoda. Rising from one pillar in the centre of an elegantly square shaped lotus pond, the One Pillar Pagoda is said to represent a lotus flower growing up out of the water and was built between the years of 1028 and1054 during the reign of Emperor Ly Thai Tong of the Ly Dynasty. You will spend the rest of the afternoon at the Museum of Ethnology which gives an excellent overview of the country's ethnic groups, their customs and ways of life. A highlight here is the large and beautiful outside area featuring genuine houses and compounds as traditionally built and used by many of the country's ethnic groups, and still remaining part of their culture today. This will give you an excellent introduction to peoples you will be seeing during your stay in Vietnam. There may also be time today for a walk around beautiful Hoan Kiem Lake or a visit to Hanoi's Museum of History, which shows life from prehistory to the present day. Day 4 - Transfer to Nimh Binh - 90km, 2 hours. Visit Hoa Lu. Afternoon visit to Trang An and boat trip. After breakfast you will drive to Nimh Binh. You drive south to the UNESCO World Heritage Site of Trang An Landscape Complex, located in Ninh Binh province. As you drive south, the landscape changes to typical limestone karst scenery with huge rock formations jutting up from the rice paddies and vast cave systems underground. Firstly you visit Hoa Lu, formerly the capital of Vietnam during the Dinh and early Le dynasties in the 10th and 11th centuries. Here you will see palaces, pagodas, tombs and pavilions built during these different dynasties. You'll then make your way to the Trang An Eco Centre where you will take a boat trip to explore the caves of Trang An. Gliding serenely on crystal clear waters your boat will take you through shallow rice paddies and through a string of caves, each varying in length. The caves have low ceilings and low-level lighting, but your local guide will navigate their twists and turns with ease. En-route you may also stop at one of the many pagodas in the area. You will return to your hotel for dinner. Day 5 - Explore Ninh Binh. Boat trip and cycle ride. This morning after breakfast you'll take a short walk to Van Long Wharf for a rowing trip lasting around 1 hour 30 minutes. As you pass through the picturesque landscape you may see different species of large water birds or even a White langur monkey. Once you've reached land it's on to two wheels for a short cycle ride to explore the local countryside. You will be able to interact with the friendly locals and lunch is taken with a local family. You will then head back to the hotel where there will be time to relax and freshen up before your evening meal. 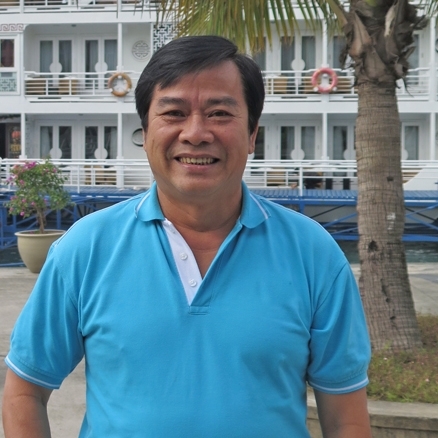 Day 6 - Transfer to Tuan Chau port and board Ha Long Bay cruise boat. Visit Cua Van floating village. Today you will be transferred to Tuan Chau port to begin our cruise of Ha Long Bay aboard the luxurious Au Co cruise ship. After a welcome drink and safety briefing you will set sail and enjoy lunch as the ship cruises towards the southwest corner of Ha Long Bay. After lunch you visit Cua Van floating fishing village either by kayak or on a traditional rowing boat. This beautiful village is well known for its location in the heart of the World Heritage Site of Ha Long Bay. Back on the Au Co, you may want to try your hand at fruit carving and join in the 'Master Chef' competition or simply relax on deck, sipping a sundowner, as the sun sets. After dinner there's time to catch a movie on board or even try a bit of squid fishing wilst the ship is anchored. Day 7 - On board Au Co cruise, Ha Long Bay. You can choose an early start today with some Tai Chi, or to take in the beautiful views as the boat raises its anchor and sets sail again. After breakfast you visit a pretty island and explore its villages and a community farm project in the company of one of the Au Co's expert guides. Returning to the boat for lunch, the afternoon is free for you to relax onboard or to kayak out to discover some of the delightful sandy beaches in the Ho Ba Ham area. Dinner tonight is a BBQ on the sundeck followed by movies and other optional activities. It is important to note that the cruise itinerary and schedules are subject to change due to weather, tide levels and operating conditions without prior notice. Swimming or kayaking excursions may be cancelled due to poor weather. Day 8 - Visit Tien Ong Cave. Disembark the cruise boat and transfer to Hanoi. Fly to Hue. This morning brings a final chance to take part in one of the Tai Chi classes available on board our cruise boat. After breakfast you will visit Tien Ong Cave. Covering an area of 1,000 square metres, with stunning stalactites and stalagmites, Tien Ong is one of the finest caves in Ha Long Bay. You re-board the Au Co for a traditional tea ceremony after which it is time to say a fond farewell to the crew members and disembark back onto dry land. You will then be transferred to Noi Bai Airport in Hanoi, for your flight to Hue. Day 9 - Sightseeing in Hue. Visit Tu Duc Tomb and cycle ride. Cruise on Perfume River and visit Imperial Citadel. Hue was formerly the capital of Vietnam during the Nguyen dynasty, 'the last ruling family of Vietnam', which ended in 1945. The city itself is a hive of culture, history and normal day-to-day business. There is a bustling local market by the river where everyday items and all kinds of food are for sale, and the streets are teeming with a jumble of cars, motor bikes, cycles and pedestrians. After breakfast at your hotel you will transferred the short distance to the Tu Duc Tomb. This beautiful Imperial tomb was designed by the Emperor Tu Duc himself and also served as his summer residence during his lifetime. It was a place where he could retreat from the Citadel to compose poetry or go hunting. After visiting the tomb you will then continue to a nearby village. You will then go on a leisurely cycle ride, about 8 kms and mostly flat, to arrive at a lovely hamlet on the shores of the Perfume River where you will visit the descendants of the Mandarin family in their beautiful ancient garden house. You will have lunch with a family in the village. After lunch in the village you will board a boat for a cruise on the Perfume River to visit the Imperial City, passing the seven storied Thien Mu Pagoda on the way. Behind the Pagoda is the old Austin car which transported the Buddhist monk, Thich Mang Du, to Ho Chi Minh City for his self-immolation in protest in 1963. You visit Hue Imperial Citadel where you have a guided tour. This Imperial City was actually a walled fortress and palace and is an astonishing remnant of the mighty power that was the Nguyen dynasty. Although many parts were destroyed and reduced to rubble by the Vietnam War, it is still a fantastic spectacle. Some of the buildings in this huge complex have been re-built and renovated to a high standard while other parts are still in ruins and require more imagination as to how they looked in their original condition. The citadel was built in the 19th century and is surrounded by a 10 km moat fed by the Perfume River. There are lots of huge fish in the moat which you can feed and then watch them in their feeding frenzy trying to grab the food. There are also a few cafes dotted around where you can sit in the shade and watch the world go by and opportunities to buy souvenirs. Leaving the Citadel you will visit the nearby workshop and gallery of Truc Chi, a contemporary artist who has created his own art based on bamboo paper carving. You will meet the artist and can try your hand at making your own unique artwork to take home. Day 10 - Transfer from Hue to Hoi An. Walking tour of Hoi An. Evening street-food tour. This morning you will transfer to Hoi An. During the 17th to 19th centuries this was one of Southeast Asia's major international ports and home to many Dutch, Portuguese, Chinese and Japanese traders. It is now a hub of culinary delights and historic buildings attracting visitors from all round the world who want to experience its unique charm. What used to be traders' homes are now restaurants, cafes and outlets for local craftsmen. The majority of the buildings in Hoi An are constructed of wood, infused with Vietnamese, Chinese and Japanese designs. Many are astonishingly will preserved and you can explore them inside and out. Next you will be taken on a guided walking tour of the city's main sights. Many of the streets are pedestrianised, making it a pleasure to walk around and browse in the shops, look at the old temples dotted around and watch the world go by whilst relaxing in one of the many cafes and restaurants. During your tour you will visit the Japanese Bridge, created by the Japanese both as a physical link and as a sign of peace between themselves and the Chinese traders who lived across a small stream. Constructed in a unique architectural style, the bridge has not been altered much since its creation in 1590. The rest of the tour will be sent exploring the Old Quarter within Hoi An which in 1999 became a UNESCO World Heritage Site. You will then embark on a street-food tour where you can sample some of the many culinary treats that Vietnam has to offer. Finally, you can have your dinner in town before returning to your hotel for the night. Day 11 - Morning visit to My Son Holy Land. Afternoon cooking class in Tra Que. This morning you will visit the My Son Holy Land. A UNESCO World Heritage Site, it is a fascinating mixture of cultures and owes its spiritual origins to the Hinduism of India. In importance and grandeur it can be compared to Angkor Wat in Cambodia or Bagan in Burma. Surrounded by mountains and home to the Cham people, My Son was created as a religious and political capital for the Champa Kingdom between the 4th and 13th centuries. The towers themselves symbolise Mount Meru, the mountain home of the Hindu Gods at the centre of the universe. As you walk around the red brick temples, you'll be amazed by the intricate designs and architectural sophistication. The setting for My Son is delightful, within a verdant valley with massive Hon Quap Mountain towering above. During your tour you will be given a brief introduction to the history of the site and the Hindu influence on it. You will also have time to explore on your own before you head to a local restaurant for lunch. In the afternoon you will hop on a bike to go cycling through downtown Hoi An and on to Tra Que, an 'organic vegetable village'. Here you will be greeted with a drink and a chance to see the farmers working their fields in the age old traditional way. Before you put your apron on for your cookery class, you will observe and learn, working together with the chef, to make traditional Vietnamese pancakes, spring rolls and Tra Que vegetable salad. Once you have admired your handiwork you can enjoy sampling the food. Hopefully you can take your new found skills home with you and impress your friends. Day 12 - Day at leisure in Hoi An. Today you will enjoy a free day giving you the opportunity to further explore the city or to take the hotel shuttle to the beach. Lunch and dinner are not included today so you can delve into the many different culinary options available in the city. Day 13 - Fly from Da Nang to Saigon (Ho Chi Minh City). Tour of the city highlights. This morning after breakfast you will take a morning flight from Da Nang to Saigon (Ho Chi Minh City), Vietnam's largest city. The fast-paced nature of the city helps this economic capital to thrive, whilst still retaining its traditions and ancient culture. On arrival you will go for lunch in a local restaurant. In the afternoon you will be taken on a city tour visiting many of its highlights including the Reunification Palace, which was the home to the President of Southern Vietnam. It was subsequently heavily associated with the fall of Saigon, when Northern Vietnamese tanks burst through the palace gates. Other famous landmarks that you will visit are the Notre Dame Cathedral - built entirely with materials bought from France - and Saigon Post Office, also dating from the French colonial era. Finally you'll be taken to the Ben Thanh Market. Packed full of anything and everything, there really are great bargains to be had here and it definitely is a real 'must see' of the city. During the afternoon, you will be taken to the Coffee Workshop to learn about the production of coffee in Vietnam and learn how to create the perfect Vietnamese Drip - a great pick-me-up for the remainder of the day. Returning to your hotel for the evening you can relax before your day on the Mekong Delta tomorrow. Your guide will be able to suggest somewhere for dinner. Day 14 - Mekong Delta - bike ride and boat ride. Gastronomic evening – craft beer and farewell meal. After breakfast you will drive out to the Mekong Delta region. The delta of the mighty Mekong River marks the end of the river's 2,800 mile journey from the Tibetan plateau. The land is pancake flat, but brilliant green - the area is known as Vietnam's 'rice-basket'. Firstly you will drive, away from more touristy areas, to Cai Thia Pier. From here you will take a bike ride to visit some local villages to see fruit orchards, workshops and homes and try some typical snacks. You will then board a boat for a trip to explore some of the smaller tributaries and arroyos of the Mekong, looking at villages along the way to see southern Vietnamese culture and way of life - the traditional farmers here produce much of Vietnam's rice and tropical fruits - lychees, pineapples, jackfruits, bananas and coconuts. You can also watch local fisherman along the river side. You will have lunch on board. Later you will drive back to your hotel. On your return you will have the chance to freshen up before heading out with your guide for a farewell gastronomic evening. Firstly you walk to Pasteur Street to see the most renowned craft beer tap room of the country. You will meet the brewer to learn about this fusion of western craft brewing techniques and local ingredients and to try some of Pasteur Street's award winning beers. You then walk a little further to an outdoor restaurant, located on the rooftop of an old apartment block, where you can enjoy a farewell meal of traditional Vietnamese cuisine. Day 15 - Day at leisure. Evening group transfer to the airport for overnight flight to London. Your hotel room will be available today for late check out at around 6pm. You are free to further explore Saigon, to do some last minute shopping in the markets or sit in one of the many cafes or bars and watch the world go by. In the evening you will be transferred to the airport for your flight back to London.